On April 25th, The Coronet is to host a very special show from Robin Schulz that will also mark the start of a new party series under the Cake banner. Only the finest in house, techno and various other styles will one up at this exciting new event, which will focus on high end production values for added atmosphere, and top live electronic performance that will be as visually as it is socially stimulating. 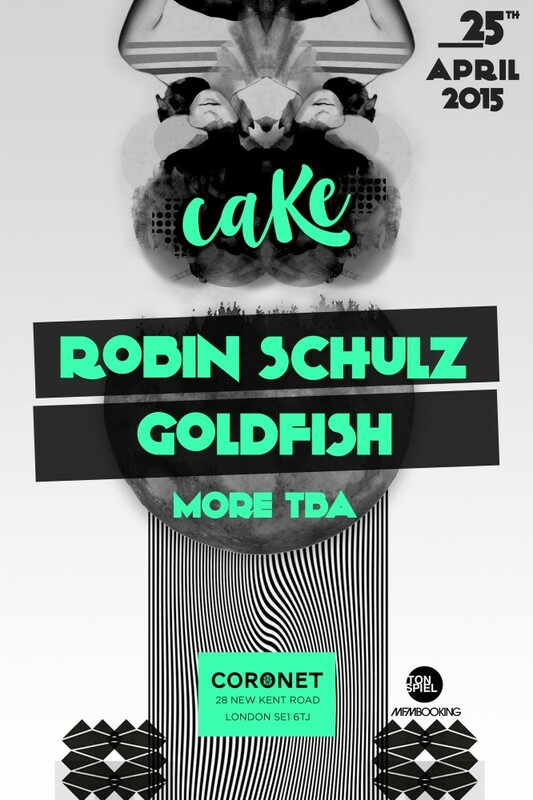 Schulz played only twice in London in 2014 at two very special parties so this event, which also sees live outfit Goldfish play, will be a treat indeed. If you’ve seen them live, you will know that Goldfish do things differently – they cook up a house and dance storm as both band members are trained jazz musicians and are competent on a vast array of instruments. The duo seamlessly merge live instruments including double bass, saxophone, keyboards, flute, and vocals with samplers, effects, synths and a healthy dollop of freeform improvisation, remixing their album tracks differently each show – as such Goldfish have hit a nerve on dance floors across the world. Robin Schulz is a German techno Dj and producer who is one of the biggest stars in the world game. He plays all across the planet on a non stop touring basis, releasing on labels like groove Life, Nebule, Traxacid and many more. Over the years his sound changed directions to tech house and deep house, which can be heard in his current tracks, mostly produced with Ableton Live 8 and always essential for dancers and DJs alike. In the heart of Elephant and Castle, The Coronet Theatre is a converted cinema that has a capacity of 2600, a state-of-the-art sound system set in 1920’s Art-Deco architecture and a late license, so is a very special place in the heart of London. With more names to be announced, this is sure to be a fine spring session.